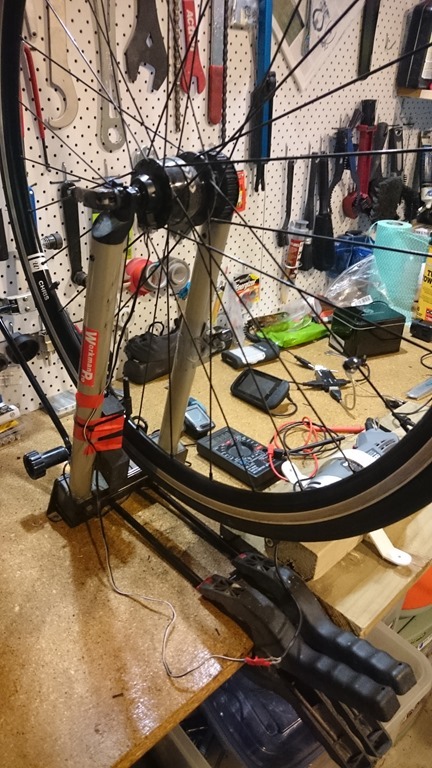 I set up the dynamo hubs in a wheel stand and used my multi-tool to spin the wheel. Kerrie from K-Lite had sent me a 3D printing file for a plastic gear that I could fit to the rim in lieu of the brake disc and run from a T5 belt. Unfortunately my multi-tool did not have enough torque to power this so I reverted to running it against the tyre. I mounted a cheap tyre for that wheel which I didn’t mind trashing. 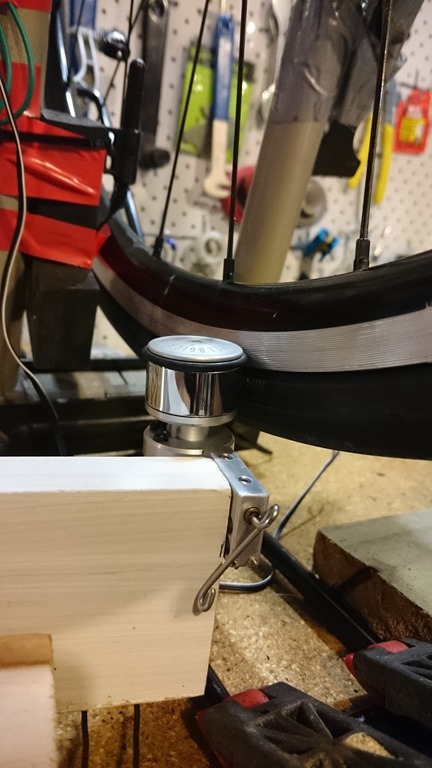 I mounted a wired Cats-eye odometer to the stand for the speed measurement. I did most of my tests with the Shutter Precision (SP) since its performance was similar to the SON (see Footnote 2). Here are a few photos of the setup. Exposure Diablo light, Garmin 1000 and Z3. 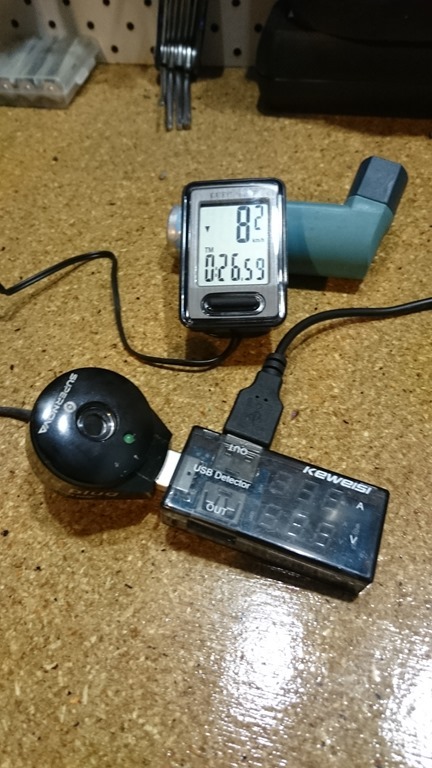 With the B&M Luxos U I tested it with the Garmin 1000, Z3, and both—using its internal light. For the Sinewave tests I replaced the Exposure Diablo light with a Busch & Muller Lumotec IQ-X light since my friend took the Diablo home to the UK. Note: When I say ‘drops’ it means that the unit was providing power but it was intermittent. Most systems follow the USB standard of 0.5 amp output but it also depends on the dynamo output. Here, the combination of the power demands of the gear (e.g. the light and the cell phone) meant that there was insufficient power being passed through (the light always gets the most power). A different light or GPS/phone would likely give a different result. There was a clear differentiation in the results for systems with batteries and those without. The ‘winner’ hands down was the ZZing. It was able to run an Exposure Revo dynamo light, a Garmin 1000 and the Z3 at the same time. This is because it was able to put out a whopping 1.2 amps. The B&M eWerk worked equally well—but it doesn’t have a battery (they have one available, but the total cost is more than the ZZing). 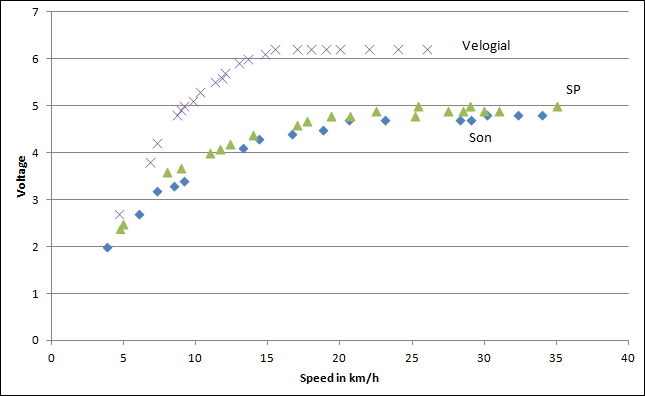 The ‘worst’ performers were the Supernova Plug III and the Cycle2Charge as they provided no power below 13 km/h and then could only power the Garmin 1000 and not the Z3. So what is the take away message? For simplicity and versatility you can’t beat the Luxos U light with an integrated USB and a cache battery. I’ve had two of them but there are two weaknesses: (i) they are not robust (all plastic and I broke one in a very slow speed crash); (ii) they are a pain to mount. For this reason, I would never use one again for long-distance endurance racing, especially mountain biking. The ZZing coupled with a more robust light (e.g. Luxos IQ-X Supernova) is the perfect pair. You will be able to power your GPS and phone and will have about 19 hours of battery life from the ZZing should your dynamo fail. Only downside is that you can’t recharge the ZZing from AC without a special adapter, but I’ve written to the developer about that. The Reecharge is a good runner up to the ZZing. It’s smaller and lighter, but had trouble running both the phone and the GPS at the same time. The battery is good for about 10 h between recharges, but you can recharge it easily from AC with a standard AC-USB power adapter. I would go for the Sinewave Revolution or the eWerk. The Sinewave comes across as more roust, but the eWerk outputs a higher amperage. Both would run well with a pass-through battery pack like the Goal Zero. The eWerk also allows you to have it output different voltages if you, say, want to recharge something like an Ay-Up 12 volt light (not that I’ve tested it!). If I was running AA batteries for other devices I would go for the Goal Zero along with a Sinewave Revolution, an eWerk or a Cycle2Charge. The Velogical gave unusual results. It was unable to power the GPS directly through the Cyle2Charge of Supernova Plug. I’ve put a video of the tests on YouTube here. The top is the speedometer which goes up to over 30 km/h. Below it is the multi-meter showing the AC voltage gets up to 6.5 volts. 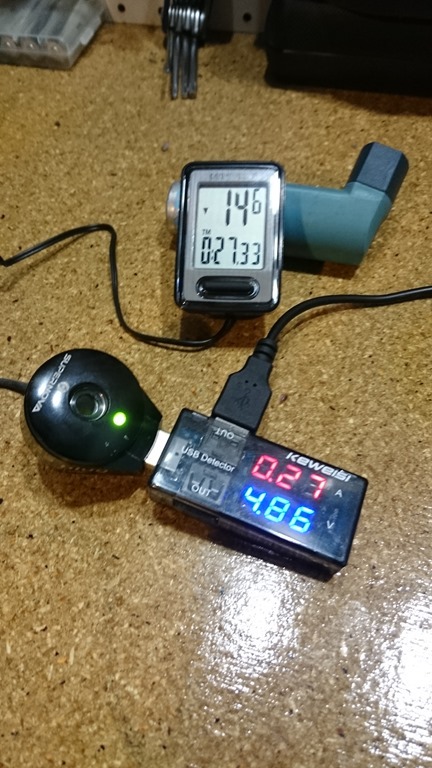 On the right is the Cycle2Charge with a USB gauge showing the output current (top) and voltage (bottom) going to my Garmin 1000. You’ll see that at all speeds these read 0 so while it was generating power, not sufficient to get through the Cycle2charge to power the Garmin. 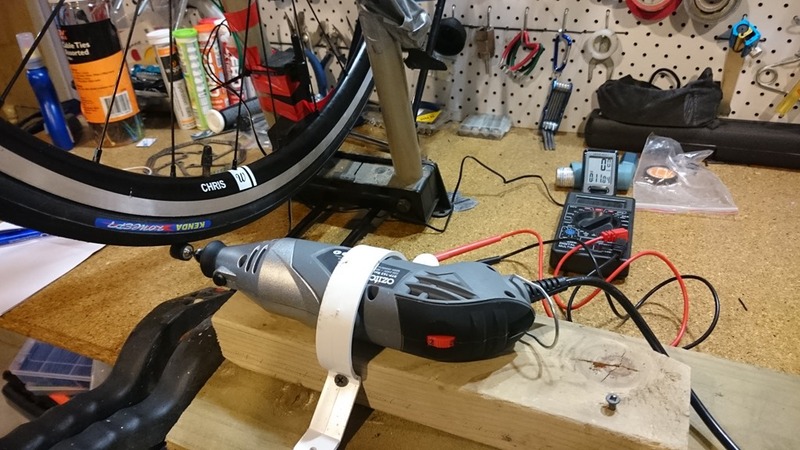 With the same setup the Velogical did provide power to the ZZing and the Reecharge, as well as powering the Luxos U light (and its internal USB battery). So you are probably safe using it with one of these systems but not sure otherwise. Will do some more testing to get a better handle on the Velogical performance. After first publishing this I was asked by someone what happened when a battery goes flat – will it power the light or the battery or ??? So I ran the ZZing completely flat and ran a test with the SP. At about 4 km/h the Zzing started to recharge. At about 8 km/h the Exposure light came on and the Garmin 1000 began to charge. You’ve correctly exposed some of the weaknesses with some of the more expensive products, which translates into the same usability problems on the road. However, you have omitted some points. 1. a lithium battery has a recharge cycle rate of 500 (on a good day). The small batteries in these converters can easily charge/discharge a couple times per day to keep up with the peaks and troughs of riding. This means you can expect such a device to require a new battery within one year of daily riding. 2. the charged battery is enabling you to power these devices under all conditions but will only do so for a limited time, typically minutes. This has skewed your table – you should perform the test with the batteries dead. 3. a lithium battery and its step down/step up circuitry will reduce efficiency by 25-30%. This is not so much of a problem at speed but does pose a problem with reduced power availability. Under this circumstance there may not be enough to charge the battery and the device anyway, making its purpose defunct. PS) if the Velogical is giving out 6V DC that is outside of USB Spec and will cause overheating (and probable destruction) of high power devices that use simple LDO’s to recharge batteries. Hi Andrew. Good points all around. I don’t fully agree with 2. insofar as it is rare that you have your batteries fully dead when you are using these sorts of systems on long distance endurance rides, but I know where you are coming from. It was a big enough lift to do this testing without taking it that far! Your point about a lithium battery recharge is really important. For this reason I tend to use a cheap portable battery pack for my daily use and save my rechargable systems for when it matters. The Velogical is definitely not recommended for all devices – Peter White will void the warranty if he finds out you used it. I’ve ordered a custom USB converter to test which I think will overcome a lot of the issues. Your table indicates free power which is not a real life scenario. If a rider is going fast enough the battery is pointless, it is only at the make-or-break end – low speed – where it matters, and then the battery is quickly discharging. It then becomes an efficiency burden. At 5V/500mah (typical phone) you will get minutes out of a small coin battery. How easy can you replace them inside the e-werk? – the 500 cycles (if you’re lucky) stands! Much better as you say to use a powerbank with passthrough than integrate it inside the unit. Unless you want to throw the unit away after a year of touring. Basically my point is, you can’t get more power out than what the dynamo creates, and being efficient with what is available (converting and putting it directly into the device) is the best solution. Andrew, your statements about Lithium Ion batteries are incredibly false. Cycle ratings are for FULL charge/discharge cycles. Partial discharge/charge cycles do not damage the battery as much as a full discharge/charge. Second: the number of charge cycles is not intended as a rating for when the battery will be useless, but rather, that is the number of cycles it is rated to undergo, and still have 80% of its nameplate capacity. So a 2000mah battery after the rated number of cycles will still have 1600mah capacity. Stop perpetuating nonsense because you’re trying to peddle your particular solution! If your product is superior, you won’t need to be making up nonsense like this. You might as well name your own solution. Competition is good and I welcome it. That’ll be why to extend battery life laptop bioses now give the option to only charge at a min %. It’s as if they know something about how topup charging reduces battery life more than a full cycle discharge. b&m use nimh in the usb werk, e werk cache and luxos u. Again, I can’t understand why, should we assume they did no real world longitivity testing?